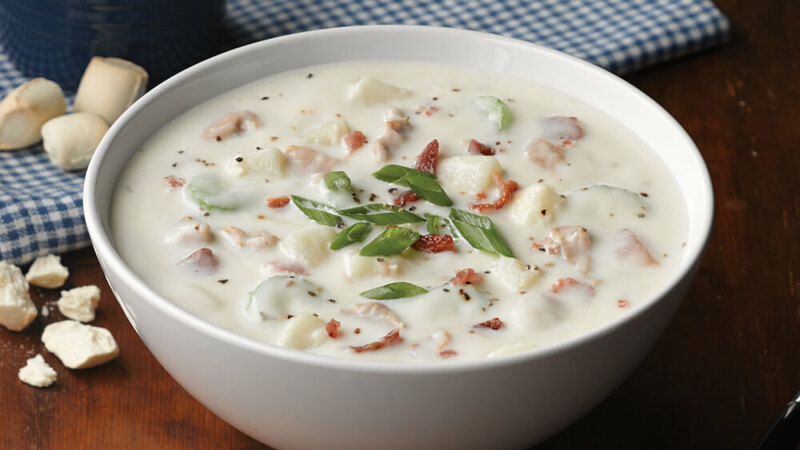 Comfort food comes in many forms, and one of those forms has to be clam chowder. If you like creamy soups, this one is unmissable. Use fresh clams for the very best result. This mouth-watering dish is made with bacon, potatoes, cream, nutmeg and more, and it's delicious if you serve it with sliced sourdough bread or even some French baguette bread. 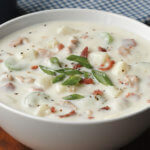 There are two kinds of clam chowder actually - the creamy kind which we are making here, which is famed in the New England region of the United States. Then you have the tomato-based type which is Manhattan style, and more prevalent in New York. Both are good, but try this creamy one. It's a favourite of many seafood fans! 1. After cleaning the clams, you need to throw out any that won't close when you tap them. 2. Now heat a frying pan over the heat and then you can add the clams and water. 3. Bring to a boil then cover and cook until the clams are open. 4. This will take 2 or 3 minutes. 5. Throw out any which haven't opened. 6. Strain the clams and keep the cooking liquid. 7. Take the clams out of their shells. 9. Next heat the butter in another deep pan. 10. Add the bacon and fry it for 3 minutes or until it's browned. 11. Add the onions and cook for 2 minutes. 12. Add the potatoes, cream, nutmeg, milk and bay leaf to the pot. 13. Add the reserved cooking liquid too. 14. Simmer over a low heat until the potatoes are tender (but not falling apart). 15. Now stir in the clams. 16. Grind in salt and black or white pepper to taste. 17. Garnish with the parsley and serve the bread on the side.